As Infor held its major European event of the year in Amsterdam last week, two partners within its ecosystem forged a new partnership. Anthesis, a UK based Infor M3 Gold Services partner signed an agreement with Norwegian Vince AS, an Infor Services partner that has developed three interesting applications. 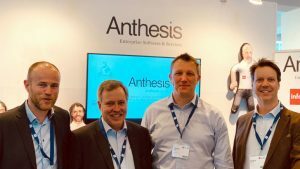 Enterprise Times asked Peter Williamson, Operations Director at Anthesis several questions about the partnership and what it would mean for Anthesis customers. ET first asked how the deal came about. As to why the deal was signed. Williamson commented: “We were immediately impressed with the quality and simplicity of the products Vince has developed which will add real value to our clients’ Infor M3 systems. Anthesis and Vince share similar company values and we look forward to working closely with the Vince team”. Key to this were the three applications that Vince has developed for its customers. VXL: This enables companies to manage data directly from Excel, still a preferred application for many users. Vince has developed an API that enables customers to update M3 records from within Excel. It enables them to create charts and map trends with data sourced from their M3 instance. An further example of its use would be enabling the Purchase Department Key User to load mass purchase price changes instead of relying on the IT Department. VSE: VSE is a security overlay for M3. It provides a graphically enhanced overview of security for things such as Users, Roles and Functions. Vince has also worked with KPMG to provide recommendations on segregation of duties. For example, it can stop cases where purchase orders are raised & approved by the same person. Furthermore, it delivers a solution that shortens any auditor engagement due to the oversight that it delivers. Under the terms of the agreement Anthesis will sell and implement the Vince solutions in the UK and Benelux. It has already sold two licenses, though these customers are yet to go live. The Vince solutions currently only work with Infor M3 on-premise. It is being developed for Infor CloudSuite according to Williamson but there is no timescale attached to this yet. For Vince, this provides an opportunity for it to extend the use of its applications into the wider Infor partner channel. Oistein Reppe, Managing Director of Vince, commented: “Our leading-edge products are in excellent hands with Anthesis who can build on the success already have. We are looking forward to a successful partnership”. One of the challenges for channel partners is that while they may develop some very interesting applications getting them to a wider market is much harder. Having announced its platform perhaps Infor should do more to publicize the add-on applications that its partner ecosystem has developed. Infor does not yet have a readily visible App market place in the same vein as SAP, Oracle, Oracle NetSuite or Salesforce, perhaps it should. There are certainly some very interesting apps developed by channel partners around the world of which Vince has developed three. The agreement for Anthesis to resell the Vince solution should be welcomed by all three parties. This agreement will benefit Anthesis customers as they look to adminster their Infor M3 instance. It will also help Vince as further sales should enable it to invest in the solutions. It will also be interesting to see whether it receives further enquiries from further afield, such as the US. Previous articleDouble win for Tipalti at SuiteWorld and what next?